This week 37 we complete our three-part series on Pranayam with descriptions of the Nadi system and some very important breathing exercises. 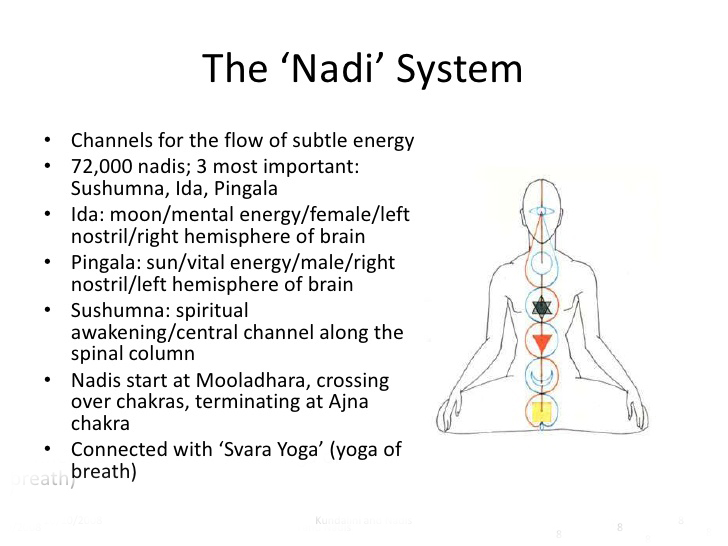 Both the channels (nadis) are the reason of existence of the human body on this earth. Ida and Pingala give nourishment to our left and right hemispheres, which control each and every activity of daily routine tasks. When Ida flows (left nostril works/right hemisphere dominated), one becomes introvert and Pingla (right nostrils/left hemisphere dominated) gives an extrovert tendency to the human being. To keep the body healthy Physically, Psychologically and spiritually, it is mandatory to flow Prana Vayu smoothly, without obstacle through the channels (nadis). Breathing is the activity of the Prana Vayu. All the nadis must be free from all type of impurities to let the Prana Vayu flows throughout the body easily and effortlessly; hence, one needs Nadi shodan activity. Sometimes there might be too much heat in the system (for example, if somebody has hot flashes or feels angry/irritable), which can be helped by breathing in through the Left nostril (to stimulate the lunar channel) and out through the right (to sedate the solar channel). This pranayama practice is called Chandrabhedana. When there is not enough heat in the system (for example, cold limbs, low blood pressure, depression), it can help to breathe in through the Right nostril (to stimulate the solar channel) and out through the Left (to sedate the lunar channel). This pranayama practice is called Suryabhedana. According to the tradition, when two sides are balanced, prana can enter the central channel – Sushumna Nadi – and travel upwards to the top of the head. Then eternal bliss (samadhi) is achieved. 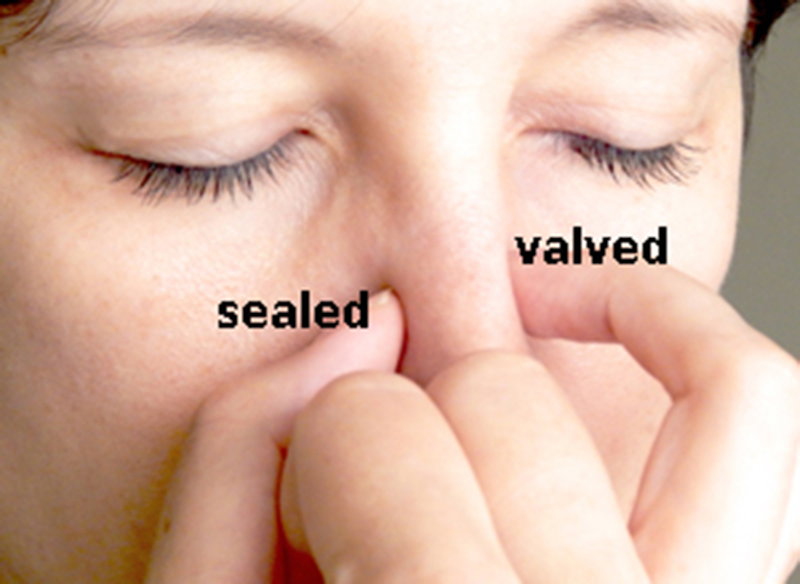 Another interesting fact: traditionally, when you breathe through one nostril or the other, you don’t leave it completely open, but rather valve it right next to the bony part of the nose, so that the opening is narrowed and a sort of vibration is achieved. We have mentioned earlier that there are many nerve branches of the autonomic nervous system in the nose, so maybe valving the nose was meant to better stimulate the corresponding branch of the nervous system (SNS or PNS) and facilitate more pronounced energetic effect? One wonders. It certainly helps you make your breath cycle longer. You can try it for yourself, too. Next time you try one nostril breathing, try valving the nostril that you are breathing through – it is a very different experience. 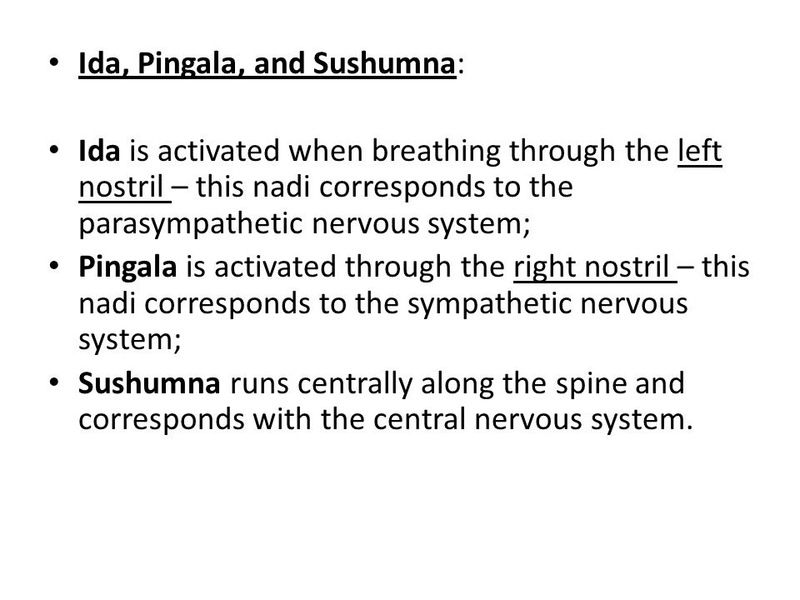 The breathing pattern is the main source of Nadi shodhan. Air flows perfectly in the tube if the tube is crystal clear. As water flows through the water pipe and nourishes the garden, same air flows through the nerves (Ida and Pingala nadis) and nourishes the body, the house of the soul. So, to stay healthy clears nadis and get nourishment through breathing exercises. 1 Sit in a comfortable Posture. (inhale) from the left nostril. force and exhale from the right nostril. and inhale from the right nostril. and night with an empty stomach, for perfect and fast results. If the above regime is followed as indicated in the 7 steps, then the nadis will become free from all impurities without delay and certainty. The breathing pattern is breath out, breathe in, switch sides. Do not force the breath – keep it gentle and natural. Allow the breath to be smooth and even without creating force or pressure. Do not breathe through the mouth or make any sound such as in Ujjayi breath. Place the fingers very lightly on the nose. There is no need to apply any pressure. While a regular yoga practice can result in improved health, know that it is not a substitute for medical treatment. It is important to learn and practice yoga under the supervision of a trained teacher. In the case of a medical condition, practice yoga after consulting a doctor. Advanced pranayama, such as longer breath retention, should be practiced with a skilled teacher. If your nasal passages are blocked in any way, wait until they are clear before initiating Nadi shodhana. Do not begin a breathing practice if you suffer from shortness of breath or high blood pressure. You can start alternate nostril breathing in the morning before launching into your day, or later when you need an afternoon pick-me-up. It can be included as an opening or closing to your yoga practice. 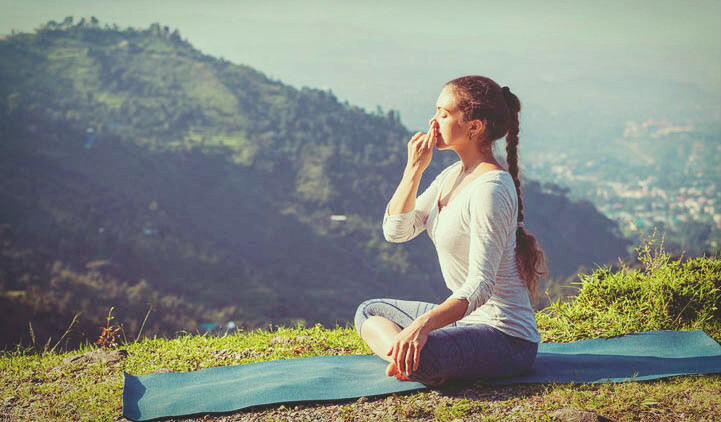 This accessible introduction to pranayama can add balance and nourishment to your life. Always consult your Health Practitioner before embarking in a new practice and have doubts. Since breathing is something we can control and regulate, it is a useful tool for achieving a relaxed and clear state of mind. I recommend three breathing exercises to help relax and reduce stress: The Stimulating Breath, The 4-7-8 Breathing Exercise (also called the Relaxing Breath), and Breath Counting. Try each of these breathing techniques and see how they affect your stress and anxiety levels. Note that you always inhale quietly through your nose and exhale audibly through your mouth. The tip of your tongue stays in position the whole time. Exhalation takes twice as long as inhalation. The absolute time you spend on each phase is not important; the ratio of 4:7:8 is important. If you have trouble holding your breath, speed the exercise up but keep to the ratio of 4:7:8 for the three phases. With practice, you can slow it all down and get used to inhaling and exhaling more and more deeply. 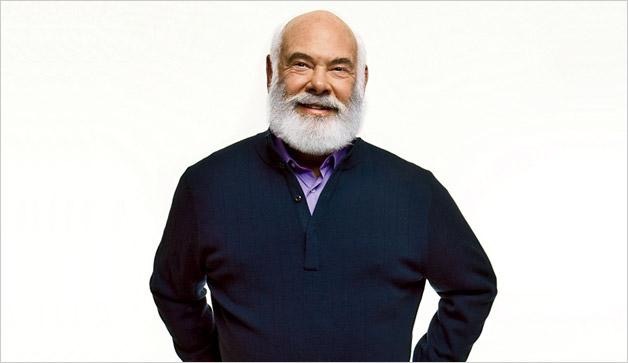 Once you develop this technique by practicing it every day, it will be a very useful tool that you will always have with you. Use it whenever anything upsetting happens – before you react. Use it whenever you are aware of the internal tension. Use it to help you fall asleep. This exercise cannot be recommended too highly. Everyone can benefit from it.